I love the beautiful picture that baptism gives “in the burial of the old life… and the new life in Christ”, as like the washing off the old life through the water and coming up clean and fresh in a new life and walk with Jesus. Furthermore, I love the clear statement to the world around in showing publicly that yes, I am a believer and yes, I identify with Jesus in publicly showing my old life buried and new life with Christ! So if you are ready to take this wonderful step in your faith journey, or just want more information about baptism please reply, call or contact me (Ken Eales or Bedros) before September 1st! In July of 1522, a young Swiss man named Conrad Grebel (1498-1526), full of vision, picked up the cross of Christ and for the rest of his life became a radical, servant of Christ and the Gospel. Grebel and a few other understudies of Ulrich Zwingli took the issue of believer’s baptism head on, or should I say head under water, with the rest of the body as well! You may have been in the Gross Munster in Zurich, where the more famous Zwingli started part of the reformation about the same time as Luther was doing the same in Germany. As Conrad Grebel, Heinrich Engelhart, Simon Stumpf and Felix Manz amongst others owed much to Zwingli and his preaching and teaching, it was Grebel who was the first to initiate a public believer’s baptism in January of 1525 here in Switzerland. This public display of pointing to baptism being that of a public profession of one’s faith after believing in Jesus Christ versus a child baptism as done in the Catholic church was enormous with consequences growing even larger with the church and state powers quickly trying to crush this new movement. The aforementioned men and others became known as the Swiss Brethren and Anabaptist reformation was now underway with Grebel emerging as one of the bold proclaimers of faith and professing it by his performing of baptisms. The fact is, they didn’t consider themselves as Anabaptists, meaning rebaptizer’s pointing out that the infant baptism did not count at all, thus the believer’s baptism was the only one of merit. 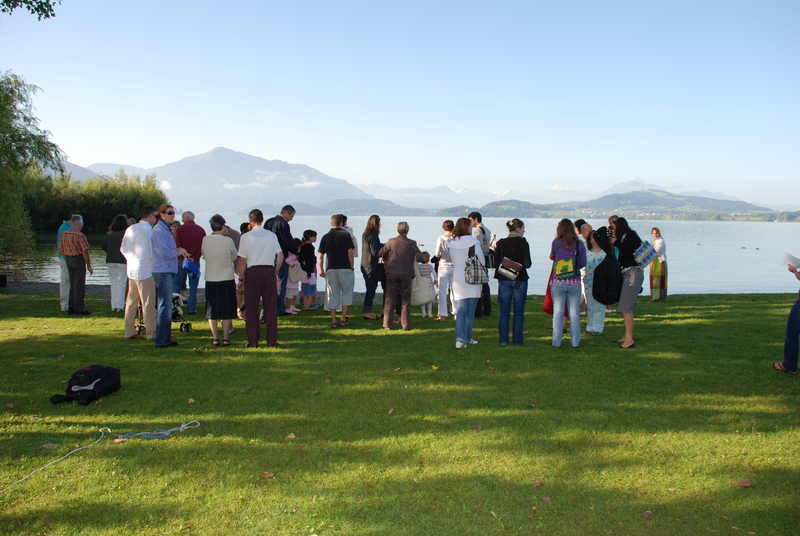 The team of the Swiss Brethren began going house to house with their witnessing and proclamation of faith in Jesus Christ, reaching new believers, baptizing and conducting the Lord’s Supper. During this time they even began baptizing by immersion. Perhaps the first immersion baptism being that of Wolfgang Ulimann, a former monk who requested “nit wolt mit ainer schussel mit wasser allain begossen” rather “in dem Rhin von dem Grebel getreckt und bedeckt werden”, which translates, “I don’t want to be poured on with a bowl of water, rather, in the Rhine river at the hands of Grebel would I want to become dunked and covered.” Just in April of 1525, some 500 believers were known to have been baptized. Eventually Grebel was persecuted and imprisoned and died shortly after his escape from prison from a sickness gained there with such poor living conditions at the age of 28. The rest is…….shall we say a continued part of Christian history, as Believer’s Baptism is widely shared today as a proclamation of one’s faith in Jesus Christ! This entry was posted in 2009, Baptism. Bookmark the permalink.